For some restaurants, enough bad Yelp reviews can spell disaster. 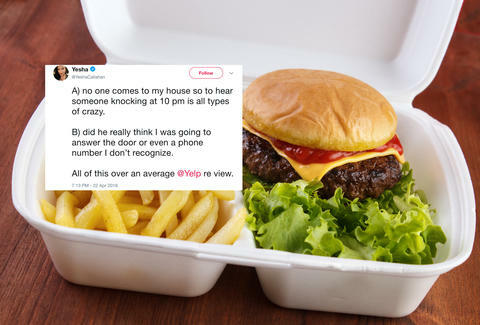 That was apparently what one restaurant manager had in mind when he showed up at a customer's doorstep at 10 p.m., demanding a conversation about an apparently lackluster cheeseburger. Yesha Callahan ordered a burger, fries and zeppoles from Italian restaurant La Porchetta earlier this week. When the delivery guy showed up at her apartment, he implored her to write a Yelp review. Callahan followed through, but was honest about the "sorry-looking steak fries," she received. She left the meal a 3-star review, but was even-keeled, saying that she was interested in enjoying more of La Porchetta's food in the future. The ho-hum review was ostensibly an assault on the restaurant's fragile reputation, because later that night, the restaurant's manager was knocking on her door, asking to talk about her review. Callahan heard banging on her door at around 10 p.m., and then received a phone call from a number she'd never seen before. "Hello, this is [inaudible name], the manager of La Porchetta. I am outside your door. I want to speak to you about your Yelp review,” the manager said. After she did the smart thing and kept her door shut, Callahan amended her Yelp review to account for the unforeseen brush with straight up terror. It's now 1-star, because no one deserves this much trouble over a damn burger and soggy fries. The restaurant's owner also apologized for the inconvenience in a reply on the website, writing: "It is clearly misJudgment [sic] from our manager to go to your house at 10pm." The owner also attributed the situation to the menu item's description on Grubhub, which she said was incorrect. In any case, Yelp said it was assessing the incident and considering "terminating the restaurant's contract for violation of their terms of service."